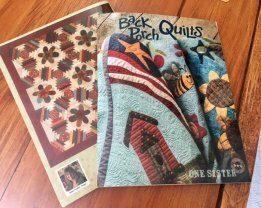 A NEW book from One Sister Designs arrived - Back Porch Quilts! This book does not disappoint - mixing wool applique and cotton applique, create beautiful projects you will love! We have a NEW sample up! Check out the beautiful wool applique on flannel wall hanging - Star of Yesterday. 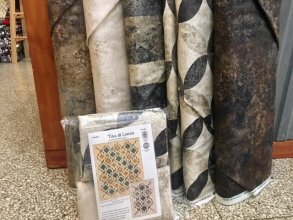 We've also got a beautiful NEW quilt kit out called Tiles & Lattice featuring Stonehenge Gradiations in beautiful neutral tones. I'm thinking this will make a wonderful masculine quilt! If you are thinking about making some quick Christmas quilts, we have a variety of Villa Rosa kits & patterns available. These are fun, simple, & easy to do! 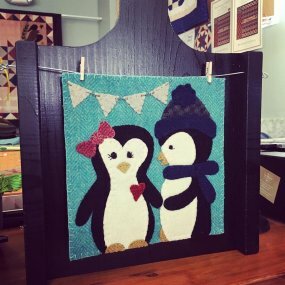 We also have a variety of small wool applique projects you could make for a loved one. 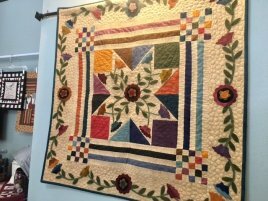 And don't forget we have gift certificates available for those quilters in your life! The boys are excited, their Nana & Papa Sintler are coming to visit this weekend! I'm sure I will have time to sneak in some sewing in between games of cards! Have a blessed weekend!